There is an old debate in the outdoor world or whether merino wool or synthetic is best for baselayers. We generally think the advantage of merino wool outperform synthetics as it is naturally insulating and will help regulate your temperature, so you’ll find that they keep you warm when it colds. Counter-intuitively, insulating materials such as merino wool will also keep you cooler when it’s warm outside. Basically, merino wool leggings are the ideal base layer for chilly days spent outside. If you’re stuck for time, here are our top 2 picks to wear under you pants and keep your toasty through the Winter. For other use case, keep scrolling. Best for: Outdoor activities in moderate temperatures. One of the most popular pairs on the list. The main features include flat-lock seams. Exists in several colors. Best for: colder outdoor activities. Similar features. Main differences are: slightly warmer, cheaper tag price (!) and a higher waist cut. Merino wool leggings are perfect for situations where you have to walk to work in the cold, but then you are in a warm office. Also, because merino wool is anti-bacterial, the leggings won’t start to smell after going for a run in them (although you probably should wash them regularly anyway). There are what seems like countless amount of options available and it can be hard to figure out which one to go for. We narrowed down the options to 15 different pairs of leggings and help you navigate with a table of content. To choose the right pair of bottoms, take into consideration the weight of the fabric and the seasonal temperatures you are planning to wear it. Merino wool is highly insulating, so you’ll find that they keep you warm when it colds. Counter-intuitively, however, insulating materials such as merino wool will also keep you cooler when it’s warm outside. The more wool it contains, the warmer and more odor resistant it is which might be a significant factor if you are going to places where washing is not in easy access. To decide if you need a lightweight or a heavyweight, consider the activity you will be participating in to decide what weight to choose. For example, if you live in Canada and plan on ice fishing all winter, look at a heavy weight option. But if you plan on hiking a lot, choose a lightweight option. Remember that these bottoms are a little different then tops since you won’t be able to take them off easily if you’re too hot. However, merino wool is great at regulating your temperature. It is a classic feature in outdoor clothing. The aim is to minimize chafing either when you wear your leggings under a pair of jeans and during outdoor activities such as hiking. It is a piece of fabric sewn between the legs for greater freedom of movement and to prevent tight fitting shorts, pants, or crops from riding up. When people report a comment such as “really weird extra space in the crotch area”, it is likely to be because there is no gusset! It makes a major difference! Some leggings offers panels on the side or beind the knees where we tend to overheat. The intent is to help is sweat management via ventilation. Pay attention to the high versus low rise, depending on your preferences and under which pants you are considering wearing it. Some have a wider waist band which can be more unconfortable under a pair of jeans but means that they can be worn on their own for running for exemple. The purpose is to help with mobility by letting you twist and turn. I noticed this when I have worn my usual pair of merino leggings as pyjama one night. They did not have band at the ankles which meant they could stay in place and were constantly rolling up my calves. 100% merino wool leggings will naturally be shaggy after a couple of hours. That is why, if you aren’t planning to wear them strictly as a baselayers under pants, you should consider the blend as it will influence how tight they are. Wool can become a bit baggy after a couple of hours of wear. That is why a blend with a touch of synthetic such as lycra can help having a more fitted form. Midweight merino is perfect for medium to active outdoor winter activities. Skiing, snowboarding, winter hiking, sledding with the kids, or shoveling the walk. The fabric weight is typically between 230 – 260 g/m2. This is enough for most winter activities and most likely to be too warm for the summer season. These 100% merino wool leggings are perfect as a baselayer for colder outdoor conditions thanks to the mid-weight 230 g/m2 material. Even if they aren’t particularly see-through, they tend to be fit loose to be trully worn or their own. The material comes as very soft instantly when you put them on. In terms of size, I am typically somewhere between M and L size when it comes to bottoms. I have tried the L which was a bit long and confortable at the waist. They fit true to size but if you’re looking for a tighter fit to wear under jeans, you should aim for a slightly smaller sizer than you’d normally take. In terms of price, these are of a fairly value for a 100% merino pair of leggings of this quality. 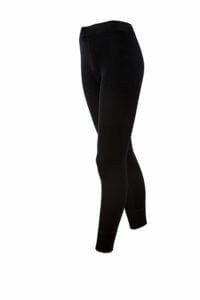 These thermal leggings come with a higher waist, soft 18.5 micron fibres and 250g/m2 weight, so they are designed for colder outdoor activities. If you’re looking for a tight fit, consider a slightly smaller size, while bearing in mind that wool does shrink slightly when you wash it. Thanks to the blend, these WoolX baselayer bottoms will satisfy the ones who don’t want to limit their merino wool leggings to a underpants baselayer. These ones are designed to be worn on their own much more like normal sports leggings (understand: no baggy knees or “pyjama look” thanks to the Nylon and Spandex!). They have a double fold waistband which enables you to customize your coverage and style for a flattering fit and comfort. They are great to wear to run in Winter or my preferred way, as a normal pair of clothings – but way more comfy than the rest of your wardrobe – with boots and a nice merino wool cardigan. Note that they don’t have flatlock seams even though I haven’t experienced chafing wearing them, neither gusseted crotch which helps movement and fitting. That said, they are stretchy enough so you don’t feel that you would rip them off in the crotch area. Icebreaker’s Winter Zone leggings combine synethic/wool blends for the mesh panel and 100% merino wool material in the rest. In theory, this should result in a longer lifespan, as these areas are stronger. But the main point of the mesh is to allow temperature regulation and improve ventilation which can be usefull in some more intense activities. It will also mean that these pants might not be as warm as the others leggings, for example. The intend of these mid-weight baselayer bottoms from SmartWool is to keep you warm in cold conditions. You can wear them under a pair of pants or alone in slightly warmer conditions. Thanks to the wide waist band and their flatlock seams which are designed to reduce chaffing, they will be a comfortable fit for active outdoor activities such as snowboarding or hiking. The waist is mid-rise. Unfortunately, the designs do not include a crotch gusset – the piece of fabric sewn between the legs for greater freedom of movement and to prevent tight fitting shorts, pants, or crops from riding up. As you can see in the photo below, it results on a wierd extra space in the crotch area. Care: machine-washable and can be tumble-dried. I use to wear the Janus 100% wool bottom that I bought during a trip in Iceland. Overall they were great. They kept me very warm, and I could only wore them in the coldest destination of our trips or in Winter season. Keep in mind than bottom layers are more annoying than tops to take on and off if you get too warm, when switching often between indoors and outdoors. They have a baggy feel after a couple of hours of wear, which is not a problem for comfort but I did not feel comfortable wear them under my dress as tights or on their own even if they aren’t see through beside as a pyjama. After a couple of wash in the wash machine, I have noticed some holes. At the time, I wasn’t very experience with merino and care treatment and I was still over washing them, even though there was no need. Hanging them in the sun can be as efficient as washing them! That said, it is not a major issue either as I was only using them as an underlayer. They will for sure keep you warm and literally never smell. It lacks ankle bands to prevent roll up when sleeping! Lightweight leggings are great for those activities in spring and summer. Fabric weight is typically under 200g/m2 and can go down to 160 – 170 g/m2 for ultralight. 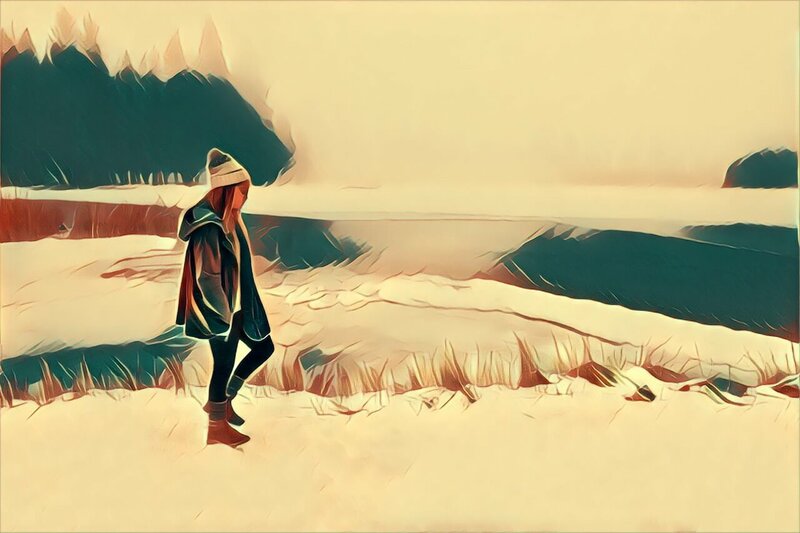 If you are planning on wearing them on their own while hiking for example, as suppose to a pyjama while camping, consider going for darker color as it is likely to be somewhat sheer. Icebreaker is one of the best known suppliers of merino wool gear. Some testers found that the leggings were a little shorter than expected – which can make sense if you are planning to wear them under your usual pants for extra warmth for example, but if you have longer legs, consider a size up. Oasis is Icebreaker’s technical range of baselayers. They are perfect for sports such as hiking of snow activities. They include a gusseted crotch for range of motion, flatlock seams and an elastic waistband. It exists in black and other plain color but we love how they come in all sorts of graphics. They also do a 3/4 length version. For activities where you might wear high socks such as skiing, you could consider a 3/4 length. Choose a long pant option for everything else. These lighter bottoms will work great in warmer conditions. Exists in different colors and 3/4th length as well. This is our budget alternative. These leggings offer exceptional value for money considering that they are 100% merino wool. Exists in all black. These lightweight bottoms function best as a base layer in summer or on warmer spring or fall days. 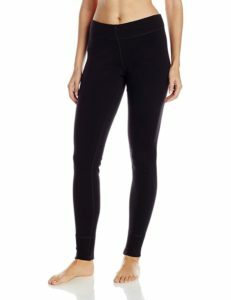 Testers found that the base layer fit true-to-size and you can wear them under jeans thanks to their lightweight material (whereas the mid-weight version will show if worn under jeans). Features such as flatlock seams, no tags and stretch cuff mean that these are designed for active wear. The most common base layers available are made of wool, synthetics (like polypropylene, polyester, or “proprietary blends”), or a mix of both. Which fabric makes the best base layer is an age-old debate in the outdoor sphere. Wool and synthetics each have their advantages and disadvantages. Blends aim to the capture the benefits of each one, but also have their drawbacks. Synthetic-merino blends aim to get the benefits of both fabrics while offering a high-quality base layer at a good price. Of course, these blends often also come with the negative features of their parent fabrics—odor retention, reduced insulation, and long drying times. Our top pick, the Smartwool Merino 150, is constructed of an 87 percent wool and 13 percent nylon fabric made of a yarn constructed of merino wool spun around a nylon core. We reached for blends when doing endurance activities like backpacking and mountaineering because we wanted the thermal qualities of wool plus the durability of synthetic. These leggings only have 11% merino wool in the material, so its odor resistance property aren’t great. We still kept it on our selection list because you might still think it is acceptable for a pair of pants to not be odor resistant, as suppose to a top base layer. Keep in mind as well that because it is mostly made of synthetic material, it is not as breathable as the other wool pants. On the other hand, it will keep you warm and they make up for this with a very affordable price. Heavyweight merino will keep you warm and safe in the severest cold weather conditions. Running heavy equipment, ice fishing, stand hunting, or any other cold weather low activity environment. Outside in very cold conditions? These heavyweight leggings might be what you’re looking for! Testers found that these leggings kept them cozy in brutally cold winters in Northern Wisconsin or while waiting around outside in low 20 degree with high windchill factors. They are Minus33 heaviest base layer at 400 g/m, but they come with all the usual Minus33 baselayer features such as flatlock seams, stretch cuffs and absence of tags for comfort. At 400 g/m, these leggings are designed to keep you warm in the harshest environments. They’ll probably be too warm for everyday wear in more moderate climates. They come with a slightly higher back rise for a comfortable fit along with non-chafe seams and an inseam gusset. I never had any issue with merino wool being itchy but in your case, it might make sense to try a blend of merino and silk like in this model from Janus. Hope that helps! Where are the merino trousers for women? I bought a pair of Ibex grey trousers years ago for my partner; she still wears them regularly. Should have bought some for myself then, and am now looking high and low for a pair for myself.